Ever the rigorous practitioner, Maura Doyle made sure to try the new ‘Unidentified’ flavour of Doritos’ tortilla chip when it was debuted recently by Frito Lay. Deciding they taste like a “ketchup taco”, she imparts this information at the end of a letter she has written to the Universe. Giant in size, like everything in this show, the letter asks after the fate of her DNA sample, which the artist had previously entrusted to a rocket ship. Querying the Universe on any manner of topic provides a good analogy for art making. In both cases you can ask questions and propose a solutions, but without any hope of definitive reply. Doyle’s practice benefits from a non-didactic approach to questions about our relationship with nature. Her work helps clarify its human component. As she once reminded us: “Sticks [are] made from dead people”. What we understand about nature is a reflection of what we understand about ourselves. 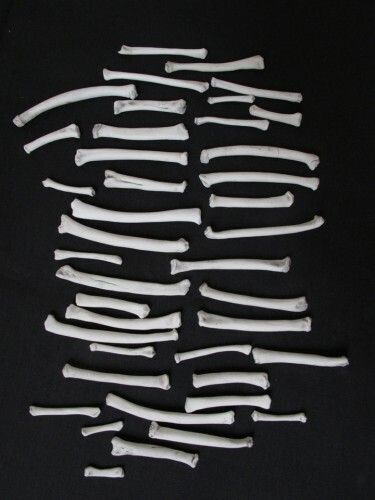 For her show at the Paul Petro Gallery, Doyle presented beautifully wrought bones made of unglazed porcelain. Made in a generalized likeness of the femur, the bones are an end (of a life) product that also make a sly commentary on the redundancy of sculpture. Elaborating on this point is a giant Tim Horton’s coffee cup, slightly damaged and ‘tossed’ on the floor. In a previous project, the artist proposed using a helicopter to drop thousands of empty chip bags into Toronto’s Sky Dome. A funny take on the idea of recycling, the work suggests the city’s premier sports stadium can double as a waste bin. Seeing the landscape – natural and man-made – as a gigantic found sculpture is one way to overcome our alienated relationship to it. In Doyle’s practice we find a reason for the increasing interest contemporary art practice takes in the world outside itself. Like her notes to the Universe, scaled-up to help them get noticed, Doyle suggests that finding reconciliation with the world we’ve got begins with giving value (and sending notes of appreciation!) to all of its elements. This text originally appeared in Hunter and Cook #6. Maura Doyle’s show Dear Universe was presented at Paul Petro Contemporary Art in 2010. More info about Maura Doyle can be found here. Doyle’s Dear Universe (2008) giant letter to the universe can be purchased at Art Metropole. You are currently browsing entries tagged with Artist at Army of YouTube.